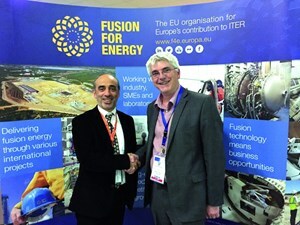 Carlo Damiani, European Domestic Agency project manager for ITER remote handling systems shakes hands with Ian Grayson, Operations Director at AMEC Foster Wheeler. 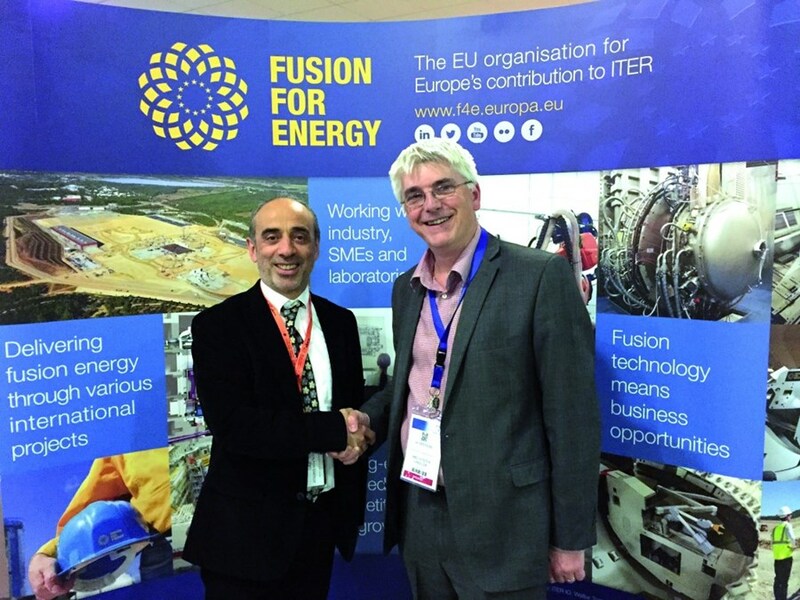 The European Domestic Agency for ITER has awarded one of the largest robotics contracts to date in the field of fusion energy. All design, manufacturing, factory testing, delivery, on-site integration, commissioning and final acceptance testing activities for the project's neutral beam remote handling system are included in the scope of the seven-year, EUR 70 million contract which was signed with Amec Foster Wheeler. A number of European laboratories and companies will also be contributing expertise, including: the Culham Centre for Fusion Energy CCFE (UK), Reel SAS (France), Wallischmiller Engineering GmbH (Germany), Hyde Group (UK), Capula (UK), KU Leuven-MaGyICs (Belgium) and, from Finland, the VTT Technical Research Centre and the Technical University of Tampere. The neutral beam remote handling system will be responsible for performing maintenance tasks on the neutral beam injectors, cutting and welding pipes, and transporting heavy components to the neutral beam cell storage area or to its main entrance for refurbishment or disposal. "Thanks to this collaboration, leading innovators will be joining forces to deliver high-end engineering for ITER's maintenance system and will push forward know-how in robotics, a field with many applications," commented the acting Director of the European Domestic Agency, Pietro Barabaschi. Read the original article on the European Domestic Agency website.